Creamy coconut milk pairs with pumpkin and warm spices to create a gloriously rich ice cream that might even eclipse a slice of pie. And it only needs five ingredients! 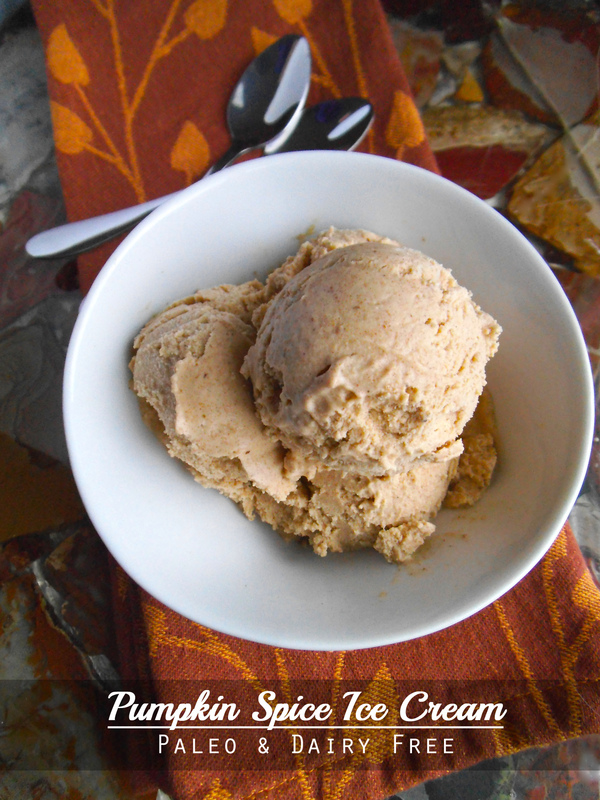 Clean eating that tastes this good makes me even happier to celebrate and “indulge.” Gathering with friends and family to enjoy some amazing pumpkin ice cream seems like a great way to spend November (or any month hereafter). Meanwhile, it’s easy to forget that the homemade ice cream we’re enjoying is just as healthy as a smoothie. For something sweet and nourishing, dates are where it’s at. Their sweetness adds to the flavour in a completely natural way. This recipe for ice cream incorporates the date soaking technique used in my recipe for Cranberry Date Tartlets. The trio of pumpkin and spices and extra creamy coconut milk blend incredibly well with the flavour of the dates. 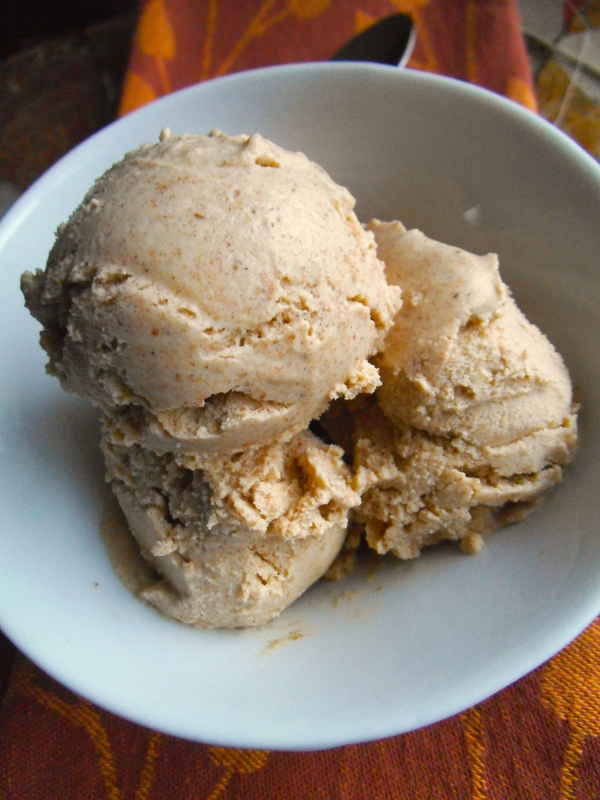 The urge to enjoy pumpkin ice cream for breakfast is something I need not resist therefore. A scoop could even serve as a legitimate topping for waffles, such as these Ginger Pear Oat Waffles. Or if you are really in a pumpkin mood, why not enjoy a Pumpkin Spiced Oat Bar à la mode? To soften the dates, pour boiling hot coconut milk over dates and cover for 20 minutes or longer to soak. Blend soaked dates and coconut milk in food processor or blender until relatively smooth. Add all remaining ingredients and blend again until smooth. Cover and chill the mixture for one hour. Pour chilled mixture into prepared ice cream maker and churn for 20 minutes or until ice cream starts to thicken. Continue to churn for a few more minutes until it is firm enough to scoop. Serve immediately. Top with whipped coconut cream, caramel sauce, and nuts if desired. Note: Any remaining ice cream can be frozen in a covered container for future use. After time in the freezer it will need to be set out to soften for about 10 minutes prior to scooping and serving. This recipe is part of Natural Family Fridays, Savoring Saturdays and may be shared here as well. I’m also sharing it at Allergy Free Wednesdays and Gluten Free Wednesdays. Honey dates to help sweeten this ice cream, how creative! Sounds scrumptious and I love that its healthy ice cream! Pinned! Thanks for sharing! I was happy that the ice cream turned out so well. And it’s inexpensive to boot! Yes, I really like recipes that have a short ingredient list- especially when they taste this good! This is such a great recipe Julia! 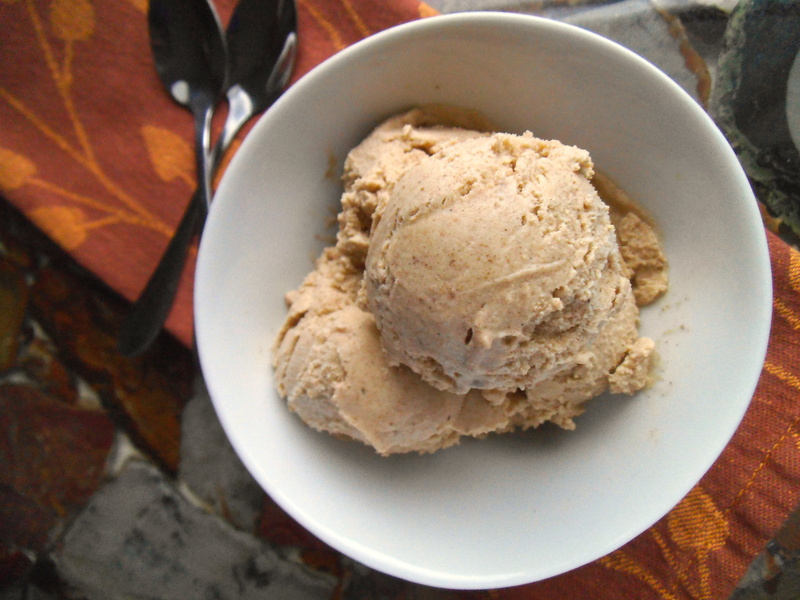 I am a sucker for ice cream and really love that you used honey dates as a sweetener! It looks so creamy and delicious! Thanks! That’s why I love coconut milk so much. 🙂 It goes well with so many of my favourite flavours, including pumpkin! I was thrilled when my husband found cans at the dollar store too! YUM! This looks really good! I love pumpkin ice cream. Me too! I always looked forward to the seasonal offering of pumpkin ice cream at the local dairy store. Now I can enjoy a dairy free version any time! Thanks for sharing on Savoring Saturdays! Looks so good! A non-sugary ice cream my children might actually eat! Visiting from Blessed Learners Pinterest party. Thanks! My daughter enjoyed some last night! You can adjust the spices to your family’s liking too. This sounds so delicious! I’m all about making ice cream out of pumpkin. 😉 Thanks so much for sharing it at Savoring Saturdays! Can you tell me what the weight of the dates would be or a cup amount for the 25 dates? It was less than 8 ounces by weight, but about 1 cup by volume. I have made versions that had more and less than that amount, and they were fine as well. The published recipe has what I think is the nicest balance of sweetness and pumpkin flavour. Sharing this on PIntastic Pinteresting Party Feature this week. Delicious. Thanks, Jill! Can you get pumpkin easily where you are now?